You are here: Home / Lost Pet Behaviors / Paper Collars: IS THIS YOUR COMMUNITY CAT? I love a good mystery. And when one of my (Missing Animal Response) students told me that a super friendly cat had showed up repeatedly outside his apartment and asked me what he should do, I suggested a paper collar. My student already knew that we did NOT recommend taking the cat to the shelter. Normally when someone “finds” a cat I strongly recommend they post a big, neon “FOUND CAT” sign in the area. But since this cat was one that kept showing up at the apartment complex and was well fed, we knew that someone was likely feeding it. So we ruled out the “FOUND CAT” sign since if this cat WAS “owned” by someone, they would see the sign and not even believe it was referring to their cat since their cat was likely coming home each night. “The very next day the collar was gone with no phone call. So I made a 2nd one. The next day that one was also gone, also no calls. The 3rd day I made one out of masking tape folded over on itself so just 2 layers of masking tape and then taped the ends together with duct tape. I didn’t want the cat to struggle with the collar but also didn’t know if she was tearing them off too easily. When I put them on her she didn’t seem to mind and didn’t even seem to pay attention to the collar, but somehow they were gone that 1st and 2nd day. So the day after I made the 3rd collar out of masking tape I got a phone call. My student added an interesting twist to the story. He said that just last week he noticed that the cat was sporting a spiffy new collar with an ID tag attached. He mentioned this to his girlfriend who proceeded to tell him that (unbeknownst to him) because she “didn’t like the cat not having a collar on” and she “didn’t want to talk to the owner,” she had taken the cat down to the shelter! She likely didn’t realize how dangerous this can be since many cats that end up in shelters are seldom reclaimed and often euthanized. Thankfully, the tactic worked. 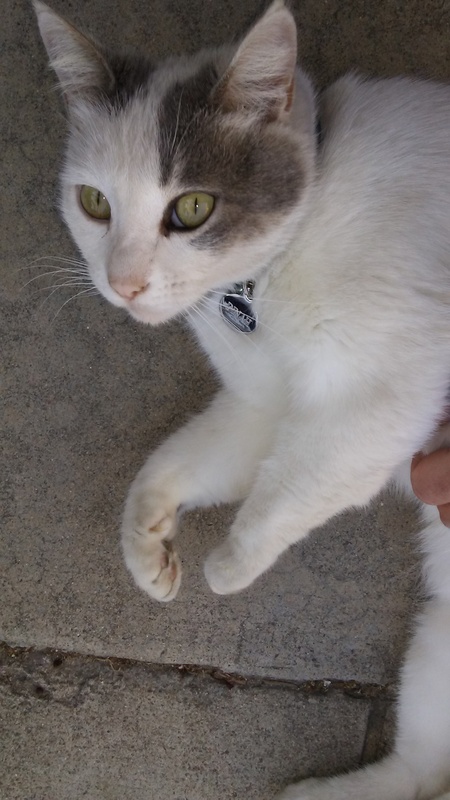 The owner reclaimed his cat, put a REAL collar (and ID tag) on her, and no longer has to tear off yellow paper collars that his friendly cat keeps bringing home! P.S. April 10, 2017 – I received a post script with a new photo from my student. Here she is…former COMMUNITY CAT-TURNED PET CAT “Dinah” wearing her glorious collar and her shiney new tag. LOVE IT! !